If you ask me, which orchid genus contains most elegant and exquisite orchids, I will answer – Coelogyne. Coelogynes don’t have giant, bright flowers of Cattleyas, nor they have colorful flowers of Vandas and Phalaenopsis. Coelogyne orchids have mostly white, green and brown flowers with few exceptions, but their flowers are exceptionally showy and beautiful. Their beauty is in a sophisticated elegance, simple combination of delicate colors, and refinement of forms – it is very noble beauty, the beauty of Coelogyne orchids. Besides beauty, their flowers often have an incredibly sweet aroma, attracting different pollinators. 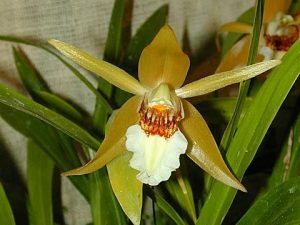 Coelogyne is a genus of sympodial orchids from India, China, Indonesia, and Fiji. 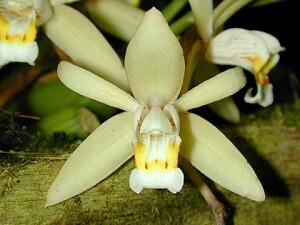 They could be seen in different biomes – from Himalayan mountain forests to tropical rainforests, and they are quite variable in their forms and adaptations to ecological conditions, so there are no general instructions about Coelogyne orchids – all Coelogyne orchids could be divided to several groups, combining species with similar growing conditions. 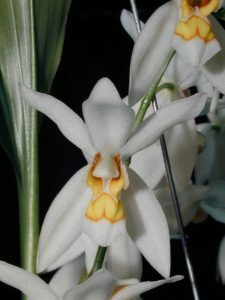 Coelogyne orchids have pseudobulbs, consisting from one node, and leaves on a top of pseudobulb. They vary in size – from miniatures such as C. assamica, C. fuliginosa to medium sized C. cristata, C. flaccida, C. lawrenceana and large sized C. pandurata, C. tomentosa and C. pulverula. Color of flowers, as well as their number can vary greatly – they can be either snow white (C. cristata, C. flaccida, C. mooreana, C. nitida and C. veitchii ), green (C. confusa, C. lentiginosa, C. lycastoides, C. marmorata, C. pandurata) or brown (C. tomentosa and C. pulverula), but there is also salmon-colored Coelogyne species (C. salmonicolor), pink (C. velutina), yellow (C. flavida), orange (C. naja) or coppery (C. cuprea). Inflorescences could be either single or fewer flowered (C. speciosa, C. salmonicolor, C. lawrenceana) to multiflowered C. pandurata, C. tomentosa, C. pulverula and extremely multiflowered, such as C. multiflora. They could be either epiphytes, lithophytes or terrestrials, but in some biomes such as Himalayan mountain cloudforests the boundaries between those are blurred, so such species such as famous C. cristata could be either epiphyte or lithophyte and sometimes terrestrial as well. 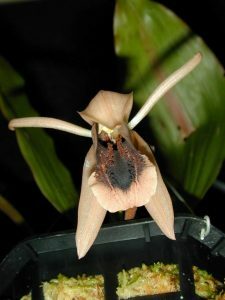 If we consider growing conditions, Coelogynes could be divided to two big groups – so-called “Cool” Coelogyne group and “Warm” Coelogyne group. Cool Coelogynes come from mountain cloud forests of Himalayan, in nature they have warm but misty and cloudy summers and cool to cold but extremely sunny winters. Such Coelogynes such as large-flowered and extremely showy Coelogyne cristata, Coelogyne mooreana, Coelogyne mossiae, lovely Coelogyne fimbriata, Coelogyne nitida and Coelogyne corymbosa. C. cristata will grow even in common plant soil that most of the other orchids couldn’t, but will not flower if specific conditions are not met. C. cristata and related orchids require cool to a cold dry period in winter with full sun – in winter light should be intensive as possible, temperatures are low, and watering should be sparse so as not to allow pseudobulbs to shiver, and no fertilizer. In early summer or middle-end of winter, flower spikes are formed and you will see extremely beautiful and fragrant flowers of this winter beauty. If it’s too warm at the moment when flower spikes are forming, they will transform to degenerate vegetative buds and new weak growths instead inflorescences. In summer you should take C. cristata to bright light without direct sunlight, ample watering and fertilizers are welcomed by this orchid. Potting mixture should be epiphytic with some medium bark, sphagnum moss, coca chips and tree fern, but as I have said earlier, this orchid grows in Himalayan mounts often as terrestrial, so it can tolerate extremely inappropriate potting mixtures such as common plant soil. It is a good idea to provide them with high air humidity in summer (up to 85%) and drop it to 65% in winter. Another group is Warm Coelogyne group. They grow in much warmer biomes such as tropical rainforests, so they are more suitable for indoor growing because they do not need cold temperatures to grow and bloom. They are mostly epiphytes or lithophytes and occasionally terrestrials. Species such as C. speciosa, C. lawrenceana and C. salmonicolor with large single flowers, which have fancy lips need intermediate to warm temperatures, half shade to filtered bright light, moderate watering and fertilizers. The substrate should be epiphytic (medium bark) with some elements with high water capacity such as sphagnum moss. They have no definite dormancy period and simply need some reducing of watering after pseudobulbs had been formed. Coelogynes such as C. pandurata, C. tomentosa, C. pulverula and other large sized Coelogynes with arching, ampelous inflorescences are warm to hot growing epiphytes. They do not need extremely high air humidity, and they need more epiphytic growing conditions. It is a good idea to pot them in hanging baskets with profound aeration holes. Potting mixture should be well draining, containing medium to large bark, cocoa chips, and tree fern. Warm Coelogynes orchid growing is rather simple – they do not need extremely bright light, bright filtered light to semi-shade is OK for them. Watering should be in frequency, ensuring pseudobulbs not to shiver too much, but not overwatering. Watering should be combined with some fertilizers when the orchid is actively growing. Some miniature and medium species such as C. fimbriata, C.oelogyne assamica, C. vanoverberghii, C. usitana and others with creeping growth habit grow better when mounted on slabs with the same growing conditions – high humidity, watering, fertilizers, bright filtered light and cool to warm temperatures – as we describe above.